Played in cold and windy conditions at Marsa last weekend, this opening match from the Mediterranean Bank Cup was competitive until the last 20 minutes when Stompers’ fitness took the game away from a battling Overseas team. Overseas, with the wind behind them, drew first blood when Mahouche kicked a penalty from 40 metres out. Almost immediately Stompers went on the attack. Richard Gum worked a 10/12 cut with Camilleri who was initially held up. However, his forwards got behind him and drove him over to score to the left of the posts – a converted try as Stompers put their noses in front. The Stompers set-piece was strong. From a scrum, Debattista broke through tackle after tackle, running 30 metres to score near the posts for Gum to convert, bringing the score to 14-3. Gum was controlling proceedings at flyhalf and even his kicks into the wind, were causing Overseas problems at the back as the Stompers backline charged through after the ball. Gareth Corcoran was trying to get Overseas on the front foot, but there was a lack of continuity as he tried to work the ball wide, cold hands at times dropping the ball. Rhys Barry, who had replaced Beppe Sammut, floated a beautiful penalty kick from 50 metres out to within five metres of the Stompers’ tryline. From the lineout, Overseas had a catch and drive to the line, for captain Anthony Harvey to score. Jamie Murray was having a good game for Overseas who had a good period of play attacking the Stompers’ line, putting them under pressure and on the back foot. From a ruck, Corcoran took the ball to the line and crashed over, to make the half-time score 14-13 for Stompers. Referee Da Silva got the second half underway with Stompers now aided by the strong wind behind them. Gum used it to drill a penalty home from 40 metres out. Overseas raised their game knowing they needed to score to stay in contention and Matthew Spiteri was yellow carded for going off his feet, trying to slow down an Overseas attack. Overseas attacked the line with quick taps from a series of penalties. The ball went wide to Barry but as he lunged for the line a head-high tackle stopped him in his tracks. However, he reached out to dot the ball down in the corner and put Overseas 18-17 in front. But in the last 20 minutes, Overseas fell away and Stompers forced their advantage, with Debattista rounding up a hat-trick. 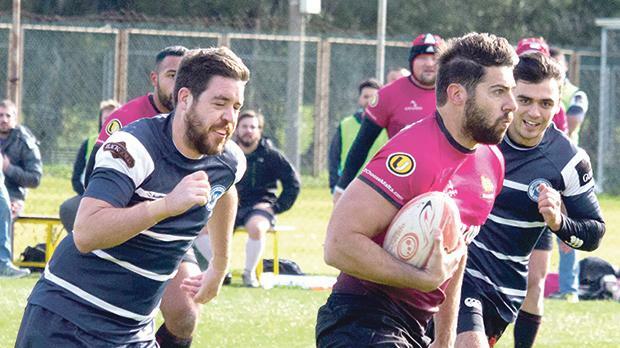 A penalty that bounced off the crossbar had Overseas in all kinds of trouble, Stompers pounced on the loose ball and went wide left to Julian Caruana who flashed down the touchline to score, making the final points of the match.